Torklift Central is a family owned and operated business that has a mission of providing the highest product quality, superior customer service and educational services to Kent, Wash. and surrounding cities. We give back to our community through projects such as food drives and special services for schools, parks, dealerships and local businesses. We pride ourselves on offering all-American made products and being a one-stop shop for our core business: The fabrication of precision crafted trailer hitches and related RV towing equipment. We strongly uphold our 42-year stellar reputation by continuing to expand the RV and automotive lifestyle. We offer national retail direct products and encourage innovations and creativity within our teams. In addition, we stand by our lifetime warranty as part of our dedication to quality and service. The Torklift story began in 1958 when Torklift founder Jon Kay began building the foundation of knowledge in manufacturing, fabrication and retail that would become a Torklift signature years later at a local hitch and fabrication shop in Tacoma, Wash. In 1973, an opportunity came up to partner with the owner of that establishment to start a satellite business in Lynnwood, Wash. That first year tested both the Kay resolve and ingenuity when the oil embargo hit. Since there wasn't much call for hitches or RV towing products, with extremely long lines at the gas pump and gasoline rationing, Jon quickly shifted focus to auxiliary fuel tanks and found a ready market to keep the fledgling company moving forward and expanding. Jon's three sons, Jack, Tony and Max also began learning the family business at this satellite location. By 1976, Jon was ready to sell out his interest in the partnership and start his own company. Torklift Central Welding of Kent Inc. started with one bay, one welder and one employee in a small building on Central Ave in Kent, Wash. Within four years, Torklift Central Welding was thriving and developing a local reputation for exemplary service as the hitch and trailer experts. The 1980′s became building years for Torklift. They acquired more real estate, built new buildings and acquired others. In 1983 Torklift Central Welding moved into the Apple & Mac tech age, being among the first companies to acquire the newly released Lisa Mac computer. Today Torklift remains 90% Apple and Mac. By the mid 1980′s, Jon and his team had used their extensive manufacturing experience to create a new Torklift line of hitches, trailers, tow bars and a wide range of custom fabrication. Customers came asking for the Torklift line from all venues: Retail, fellow dealers, municipal and local government agencies and more. All of these endeavors coupled with a spirit of excellence and a strong focus on exceeding customer expectations swiftly gained the respect of the region. By 1990 the company's rapid growth required the separation of the manufacturing division from the rest of the organization. The mid 1990′s were a time of continued innovation for Torklift and included the acquisition of new state of the art CNC equipment. Revolutionary ideas were designed and saw fruition, many of which patents were sought for. 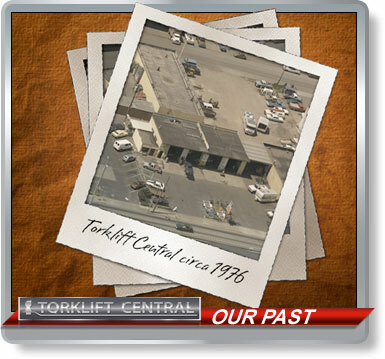 The late 1990′s saw the manufacturing division of Torklift grow so large that a separate management team was formed. By the year 2000, the Torklift line of products had become so popular that the manufacturing/product development arm of the company was forced to split off. That branch ventured further into the wholesale world, while the original Torklift Central Welding continued to specialize in local fabrication and installation. Although the Torklift leadership team knew the split had to be made, it was still several years of careful planning and patience before everything was ready to make that leap. Finally, the industry's first lever-action turnbuckle was introduced. Like wild fire the Torklift FastGun turnbuckle took the market by storm and provided the boost Torklift International was looking for to break away from Torklift Central completely. The Torklift International administration, packaging and warehouse all relocated, though headquarters remained in Kent, Wash. Most recently Torklift International has invested several million dollars toward its future location on 6 1/2 acres and has outlined long-range plans for full development beginning in 2008 and carrying years into the future. Torklift Central Welding continued to provide superior customer service, maintained its reputation as an expert within the industry and has seen unprecedented levels of growth. The result was that in 2009, Torklift Central Welding split again and Torklift Central RV Center was born. This new division and second location was centered on a core group of seasoned factory trained techs with certified master tech experience and 50 years in the industry. The latest addition to the Torklift Central Welding group was welcomed by the three generations the company proudly served. Currently, the original Torklift Central continues to focus on towing accessories for both RV and commercial vehicles, welding and custom fabrication, as well as trailer brake, axle, suspension work and repair. In addition to engaging and knowledgeable professional team members, Torklift Central Welding boasts CNC Plasma/AutoCAD/Solidworks, Finite Elemental Analyisis and machine capabilities, trained on-site consultants and a variety of patented industry name products to serve their customers' needs. In 2011, Torklift Central saw a demand for aftermarket hitches for electric, PZEV (partial zero emission vehicles) and hybrid vehicles. The EcoHitch was born in late 2011 and continues to grow with the development of new eco-vehicles to market. With the growth of the EcoHitch line in 2013, Torklift Central refocused all of their efforts to continue the expansion in the aftermarket trailer hitch industry. By expanding the original location, Torklift Central utilized all of their resources from the RV Center to contribute to the growth. Today, Torklift Central remains a top player in the RV and towing industry as well as the electric, PZEV (partial zero emission vehicles) and hybrid aftermarket accessories industry.